Celebrate the casual and carefree West Coast aesthetic with this 8' 6 round cozy milky white shag rug from Safavieh's sensational California Shag Collection. Instantly brighten up any hardwood or tile floor to create a calming atmosphere that allows for a wide range of versatile styling options. This is a beautiful, thick, plush rug! It is very soft. It feels like it is a high quality rug. It is white, but not pure white. I would say in between white and ivory, but looks fine next to a white platform bed. Great rug, extremely soft under foot. It is a thick shag, so make sure you have a a vacuum that is equipped to clean it. If so, you will be in love with this rug. Color is true to the picture, white but not stark white. What a LOVELY, thick, shag rug!!!!!!!!!! The color isn't pure white, but maybe it's the lighting in my living room? For me, it's more of an off-white. Anyway, the size is spot-on, the thickness is glorious, could be softer - no big deal there. Arrived on-time and in good condition. My client was most pleased with this rug. The rug is very soft and extremely plush. Great rug for the price! PROs: - Arrived 2 days early! - Super plush and cushy - My 2 year old toddler absolutely LOVES this rug. He loves to roll around on it and read his books. - Has really pulled his room together and made it warmer and cozier CONs - We don't wear shoes in my son's room but whatever debris gets in the rug, you have to fish out. - It's white so stains show pretty easily but I knew that going in so not really a point against the rug. I highly recommend! This rug is AMAZING!! Beautiful rich milky white in color, & a thick plush Knapp that feels like heaven to walk on! So Very Pleased with this product! Highly recommend!! Delivered in 3 days!! The rug is great quality. I love it! Very soft and so fluffy. Not a cheap rug at all. Very high quality rug. Don't hesitate to buy. I'm always afraid to buy rugs online, but this one exceeded my Expectations. This is an awesome rug. Looks great, feels great under feet and is a Rich off white color. Great purchase. Safavieh rugs are the best. Overstock is a great place to purchase from. Very happy and will be back to shop again. I love everything about it. 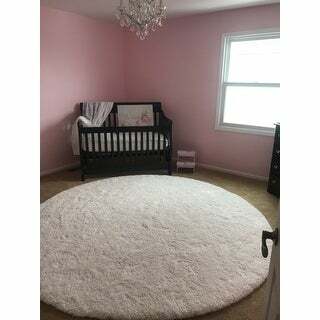 The delivery was quick and the quality of the rug 100% to my satisfaction. daughter always wants to lay on it! Exactly the look I was seeking! Pure elegance! Color was accurate. No smell as happens with other rugs sometimes. Pile was good. Fits perfectly in my husband's office but I would not use in a high traffic area as it does not appear to be easy to clean. Still haven't unraveled, but am pleasantly surprised by the size and packaging! Once the floor is installed, I'll put it down and take a pic (going over cherry 5" planked bamboo). Very nice rug. Works perfectly in my library. Vacuum in one direction becuase it is difficult to pull an upright back and forth on the shag portion of the rug. Friends liked the look so much they purchased one for their home. I absolutely LOVE this rug. Plush, white, comfy! My pups love to lay on it and sleep. Great for lounging. Cleans well. Very big. Covers half of my living room. Returned! It arrived with a black spot on it. Item didn't look as pictured. Soft, pretty rug. Thick like the photo. Safahiev's rugs are wonderful. Love this rug!!! Rolled out beautifully no curling. Thick and plush. Better than the picture. Getting another one for the bedroom. "Could you vacuum this rug if you used the bare floor/no brush roll setting?" We recommend turning shag rugs over and vacuuming the back to loosen up the dirt and have it come out that way. It appeared to be the best value for my money.